Clen-40 or in the common people "maple" is a non-steroidal drug, as many novice athletes or people who are far from the world of sports believe. This tool was developed exclusively for medical purposes in order to alleviate the condition of patients suffering from bronchial asthma. Later, it “migrated” to the sports sector, where it found widespread use among fitness lovers, bodybuilders and representatives of other sports disciplines due to its ability to effectively and quickly eliminate existing fat accumulations. 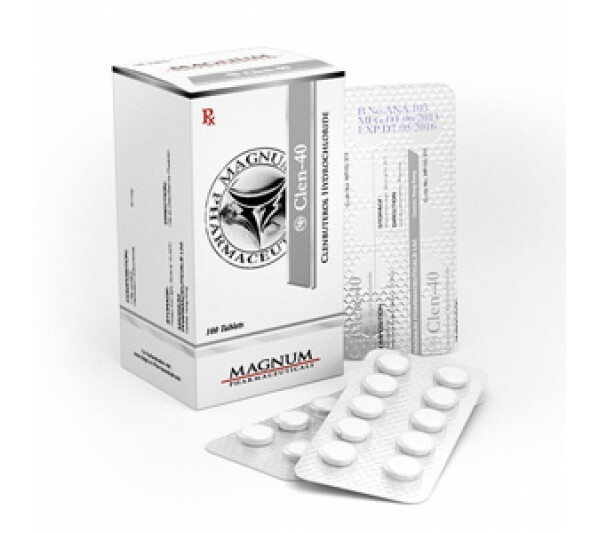 Clenbuterol Magnum is ideal for people who set a goal to bring their body in order. Taking the drug with proper nutrition will help to remove the fat layer and give density to your muscles. It is precisely the flabbiness of the muscles that does not allow getting a good fit of all problem areas. Normal fat burner helps to remove only the percentage of fat, but the muscles do not become tight and fit. Clenbuterol has such an effect as increasing the elasticity of the general muscles. maintenance dose of the drug - about 20 mg per day. Magnum Clen-40 for girls and men is a unique opportunity to remove excess weight. If you need to pump up, ladies should consider buying Oxandrolone for girls other than fat burner. Starting maple intake, do not forget that everything is done gradually, and do not even think about starting right away with the maximum doses. The effect of taking Magnum Clen-40 often depends on the human body. In practice, the result is very different, and even not predictable. Definitely, this drug is bought not only by athletes, but also by many guys, and certainly girls. pregnant women of any age, as well as during lactation.